Alfred Sisley was born in 1839 in Paris of English parents, Like his friend Claude Monet, he preferred to paint the ever changing reflections of atmospheric light, especially on water, and devoted himself almost exclusively to landscape painting. Sisley’s favourite subjects were water, skies, snow and the mist effects which he painted with great sensitivity and skill. His best paintings are among the most lyrical and gently harmonious works of the Impressionist movement. 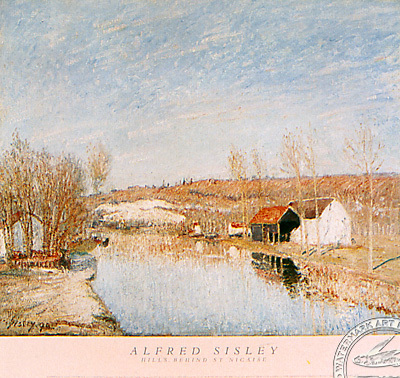 Sisley was something of a dilettante and enjoyed a generous allowance up until the time of his father’s bankruptcy in 1870. Thereafter he spent much of his life in poverty, neither claimed by the French or the English, he never really won the acclaim or accolades awarded to his colleagues. Sisley visited England several times but otherwise travelled rarely.